Back when we were flush with cash, I had an easy relationship with brand name products—I bought them. In the few cases where there was an easily discernable choice, e.g. some basic food item like frozen corn or canned tomatoes, I would do a comparison between the brand name and generic product. Sometimes there was no difference, and I’d start buying the cheaper version. But often there was a difference, if just a slight one, and I generally didn’t bother trying to quantify its worth; the extra expense wasn’t significant, and so I’d buy the brand name. And this only covered a miniscule portion of the items we bought. More often it wasn’t feasible to do a thorough comparison of the brand name and generic products—baby food? car seats? garden tools? DVD players? laundry detergents? clothing? tires?—and a brand name is, well, a brand name. Some company had poured lots of money into creating an aura of quality for its products in my mind, usually not based on any tangible facts. So when it came to choosing between a brand name product and its generic equivalent, saving money was usually less important in my mind than the feeling, often baseless, that the brand name product was somehow better. Often it was, at least in subtle ways, and that reinforced my preference for brand names. But rarely did I sit down and think through whether the difference was worth the price. The preference I’m describing here is different than a preference among brand names. I’ve been unplugged from the media long enough that I can barely distinguish between the different brands in most categories. The only loyalty that occurs to me offhand is a nostalgic one, a preference for Japanese cars over American, and for Hondas over the rest. I’m sure if my first car had been a Toyota or a Nissan, or even a Ford or Chevy, that preference would have endured as well. But still what matters is that it be some sort of brand name—I wouldn’t have hesitated much to take any of the brands mentioned above, but I would have probably hesitated about a Kia or Hyundai, and probably still would since those brands aren’t established in my mind. As cash becomes more precious to us, my behavior is changing. When I buy food now I will almost always buy the house brand except when it has been established that we just don’t like it. Sometimes our dislike of a particular house brand will lead us to not buy the product at all; nobody seems to make a palatable generic Triscuit, but since real Triscuits are more than double the price of the generic, we either buy Triscuits when they are deeply discounted, or not at all. Some house brands are better than others; Kroger club crackers are much better than the Wal-Mart version, and since both are less than half the price of the Keebler kind we make sure they are on the list when enough Kroger-specific needs have accumulated to make a trip to Kroger worthwhile. We use disposable diapers, and until recently we bought Pampers because they seemed to fit our kids better than Huggies; house brands were not even in the running when we first started diapering. The prices of brand name diapers are both high and variable; I always made a special trip if needed to K-Mart or Wal-Mart, where I could get a box for around $20, while in the grocery store they run $25-28. Then a couple of months ago I happened to check the prices at Wal-Mart and was unpleasantly surprised—the higher-priced house brand (White Cloud) was only $13, and the lower-priced one (Parents’ Choice) $11. I bought small packages of each, and after a few uses we decided that the White Cloud diapers were significantly better than the Parents’ Choice, well worth another $2, and while not quite as good as Pampers we could live with their shortcomings in order to save 35%. Even more shocking was when I priced baby formula. Peter wasn’t getting enough calories from nursing alone, so we decided to supplement with formula, something we’ve done with at least one other child. Initially I bought Similac for $25-28 per can because, well, that’s what we had always bought. Then I happened to notice the house brand (Parents’ Choice) was less than half the price, about $13. Same size. Same ingredients. Can’t testify about the taste, but Peter didn’t complain about it. I suppose they aren’t completely identical—but how can I even begin to compare the differences, much less judge whether they are worth the difference in price to me? Years ago a friend pointed out the obvious to me: when you worry, you live through your troubles at least one more time than is necessary. Since then I’ve tried to limit the pain, if and when it comes, to the moment itself, not adding to it by fantasizing about it in advance. One thing that has helped with that is learning to recognize a worrisome event in advance, and then making a point afterwards of assessing the situation afterwards. It almost always turns out that the worry I indulged in (or would have indulged in) was way out of proportion to the actual trouble when it came. Go through this exercise enough times and you will worry less, simply because you come to understand that it isn’t worth the grief. This past week there has been a perfect opportunity to rehearse that attitude, imperfectly met. A few weeks ago a friend offered us a very nice 1986 Volvo 240DL wagon at a very good price, so that Chris could have his first car, and we gratefully accepted. Since the car is in Charlottesville, Virginia and isn’t running reliably at the moment, we will have to tow it from there to here. While arranging for a U-Haul towing trailer, I discovered that the hitch on our Suburban was not strong enough to pull car and trailer. The Suburban is capable of towing much more, so I decided to go ahead and get a heavy-duty hitch installed, for this and for future hauling jobs. I figured that U-Haul knew about these things, so I contacted the nearest hitch installation center (in Lexington), ordered a hitch that could handle anything the Suburban could pull, and made an appointment to have it installed last Friday, about ten days before we needed to leave to fetch the Volvo. I left early Friday, intending to run a number of errands while in the Lexington area. I first drove north of Frankfort to Earth Tools, to buy a replacement plowshare for the plow attachment on our BCS tractor (we’d worn out the first). Then I drove over to Lexington, arriving at the U-Haul place at noon. I expected to spend about an hour there, then do a bit of grocery shopping, then leave town around 3pm in order to be home in time to get Chris and go to our weekly music gig at the Bread of Life Cafe. After about two hours of sitting in their tiny, windowless break room, the hitch installation guy came in and asked me to come look at the Suburban. He explained that in order to get the old hitch off and insert the bolts for the new hitch, they had had to drop the gas tank by taking off the straps that attached it to the underside—and now they were having a heck of a time reattaching the gas tank. I nodded, and wished them luck. After another hour, the fellow gave me the good news and the bad news. The good news was that they had finally gotten the gas tank reattached. The bad news was that the bolt holes for the old hitch did not match up with the new hitch; to install it they would need to drill new holes … and that would mean dropping the gas tank again, something they weren’t very enthusiastic about doing. They recommended I find a Chevy dealer who could do it. I couldn’t blame them, so I thanked them for their efforts (which they didn’t charge me for, of course) and headed home, not having time to do any of my other errands. Now I had a Suburban without a hitch, and in the back both an old hitch and a new heavy duty hitch. It was late Friday, so there was no opportunity to call around and find out if anyone All the way home I wondered if I should have returned the new hitch before I left, since now I wasn’t sure I would be using it—whoever I found to do the job might want to do it with whatever hitch they carried. And I spent some time worrying about whether I’d be able to get everything arranged in time for the trip, which had to happen on the arranged day. By the time I got home, though, I had managed to put it all out of my mind, knowing that I wouldn’t be able to do anything about it until Monday morning. Monday morning I got ready to make phone calls. The sort of phone calls I dread making; I much prefer having done all my research and settled on a solution before picking up the phone. But it turned out easily enough—I called a dealership in Somerset, the closest town of reasonable size, and they said that they did install hitches and, although they didn’t have any in stock for my truck, they’d be glad to install the U-Haul hitch. It was about time for a major servicing on the Suburban, and the brakes were starting to squeal, so I arranged to have all that done as well. The appointment was set for 9am Tuesday. I arrived about fifteen minutes late, and I don’t think they took my car in until 10am or so. From there it was a long, quiet wait; the staff was not particularly communicative about what was going on. Around 3pm a fellow came to tell me that (1) they wouldn’t be able to get everything done that day, (2) the remaining tasks were to fix the brakes, align the front end, and (!) put on the trailer hitch, and (3) they would probably be able to get the brakes or the alignment done by the end of the day, but not the hitch. So I asked them to do the brakes, and told them I’d be back first thing in the morning so that they could do the rest. I was tempted to worry and frustration again over the fact that another day had gone by and I still didn’t know if the hitch was installable, but I decided not to go there until the problem actually materialized. This morning I was back at the shop by 8am, and at 9am a customer rep came to double-check that I wanted the front end aligned—and oh yes, the hitch was installed. In another hour I was on the road back home. Now, I’ve been through this exercise so many times before that most of my reflecting on these events was done as they unfolded. But on the drive home I went over it all again, and realized that in fact the only part that might have been considered a waste was the time spent waiting for the U-Haul folks to fail to install the hitch. Everything else that happened needed to happen—ordering the hitch, fetching it, having it installed, and having the Suburban extensively serviced. Even if the uncertainty about the hitch installation had been resolved earlier, it wouldn’t have changed anything except to give me peace of mind earlier on, something I was perfectly able to give myself anyway. I’ve been thinking about mortality lately, in a positive way. Last Sunday we all drove down to Nashville (in two vehicles; we thought we’d squeeze all nine into the Suburban, but comfort and safety issues changed our minds at the very last minute) to celebrate with my family, who had all converged there on the occasion of my mother’s 80th birthday. Everyone else was there for the weekend, including a Saturday night outing to the Grand Old Opry, but these days as a family we can only afford to make day trips where we can drive—and it is a good thing our cows are dry at the moment, or we wouldn’t have had the luxury of twelve hours away. It was a good time. My mom has recovered well from a stroke she had a while ago; she has occasional memory lapses, but is also aware when she has had one, and in general isn’t much different than she’s ever been mentally. Physically she’s slower and more tentative, but still getting around under her own power. My dad, who turns 79 in November, is doing great, sharp as ever, mellower than ever, in excellent shape. He reminded us several times that we’d be reconvening again in Nashville in November 2009, to celebrate his own 80th birthday. I never got to visit with my folks often since leaving home in 1971, even less when we moved to the eastern part of the country in 2001. I regret that, but I do get to enjoy them a little more objectively than I might if they had been a constant presence in our lives. What I’ve enjoyed about the past ten years or so is my growing understanding that they are finishing well; time is growing short, but they aren’t marking time or frantically trying to get more in or raging against the dying of the light, but simply completing the course they set out on oh so many years ago. It’s gratifying to see, and it’s encouraging. I think about this because I’m roughly twenty-five years behind them, having just turned 54, just passing the two-thirds marker. And Debbie and I are about to celebrate our 23rd anniversary, so by that reckoning we are approaching the halfway point. Only now do I feel like I can think detailed, concrete thoughts about the rest of the course, given the current combination of so many miles already traveled and the goal finally being near enough; planning the next twenty-five years is manageable, and I finally have the experience I need to do it. He prepared his children for what was to come. And by that I mean what is to come both eternally and temporally. It’s been our project ever since we started a family. It took a long time for the two of us to figure out which way to go, it took no small measure of courage and determination for us to begin walking down that path, and only now are we getting a clear view of the life we think we should be living, at least in outline. It’s turned into a lifetime project. But that’s OK; as they say, it’s for the kids. I live on Earth, but it turns out that there is another planet very similar in appearance to Earth but very different in its thinking. For example, the people on this planet thought that they could re-invent the structure of the family, and that their reinvented families would work simply because they wanted them to work. I have to wonder if these words reflect actual thoughts, or are simply phrases cobbled together and parroted from whatever crazy propaganda they must be inundated with. How could you write such things and not immediately recognize the absurdity of your thinking? Lord, protect me from ever having to visit this planet. I don’t know if I’m strong enough to resist the forces that seem to have swept so many away. I’ve been following the economic news pretty closely since December 2006, when Pastor Thomas McConnell sent out an email that awoke me from my dogmatic slumbers. I deliberately avoid writing about items in the news that are well known and more or less self-explanatory. But occasionally I read a report that I can’t immediately understand, that doesn’t fit in well with what I already knew, that makes me stop and think “Hmm, what the heck does that imply?” Those are the ones I tend to post about. So don’t be bothered if you read one of these posts and end up puzzled about what I’m getting at; it’s probably news that puzzles me as well. Of all the economic turbulence that’s been reported on this week, it was this tidbit about coal prices that gave me pause: coal prices have nearly doubled in the past three months. China’s coal consumption is mind-bending. China is currently building giant, 500-megawatt coal-fired power plant systems in an almost assembly line fashion. And China is installing and commissioning these coal burners at an astounding rate of THREE per WEEK!!! Each year as of late, China has added more electrical generation capacity than the entire nation of Germany. And Chinese electrical generation capacity has been growing at a steady rate of over 15% per year for the past five years. I just stumbled across the website for Sylvanus Farm, a working CSA farm, which is apparently for sale. I know nothing about it except that it is located in Burkesville, KY, about 60 miles southwest of us. The asking price is $189,500; here is the listing. Some of my readers are probably old enough to remember the famous 1980 bet that supply-side economist Julian Simon made with doomsaying Population Bomb author Paul Ehrlich about whether resources were becoming increasingly scarce or not. Simon countered with “a public offer to stake US$10,000 … on my belief that the cost of non-government-controlled raw materials (including grain and oil) will not rise in the long run. You could name your own terms: select any raw material you wanted – copper, tin, whatever – and select any date in the future, “any date more than a year away,” and Simon would bet that the commodity’s price on that date would be lower than what it was at the time of the wager.” … Ehrlich and his colleagues picked five metals that they thought would undergo big price rises: chromium, copper, nickel, tin, and tungsten. … Between 1980 and 1990, the world’s population grew by more than 800 million, the largest increase in one decade in all of history. But by September 1990, without a single exception, the price of each of Ehrlich’s selected metals had fallen, and in some cases had dropped through the floor. Chrome, which had sold for $3.90 a pound in 1980, was down to $3.70 in 1990. Tin, which was $8.72 a pound in 1980, was down to $3.88 a decade later. The price of raw and other natural commodities such as oil, gold, and uranium have risen substantially in recent years, due to increased demand from China, India, and other industrializing countries. However, this short term price increase is not contrary to Simon’s cornucopian theory. The key assumption, of course, is: “But in a free society, solutions are eventually found. And in the long run the new developments leave us better off than if the problems had not arisen.” I’d be more comfortable with this claim if the cornucopians would provide more examples of where key industrial commodities became scarce and were then replaced by other materials or processes, leaving us better off. Right now the short run seems to be piling on the bad news. Here are a couple of interesting charts. Bismuth and molybdenum seem to be getting scarcer. Will we be able to replace them? 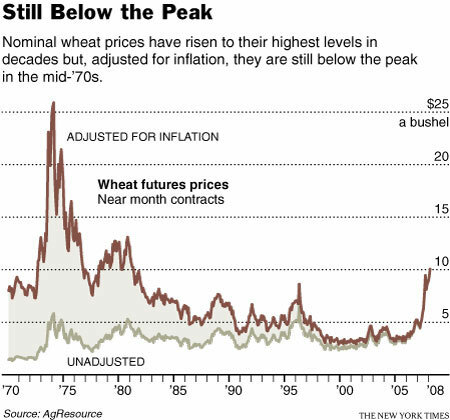 Rising food prices are also in the news. I like this chart because it is adjusted for inflation and takes a long view. We see some significant pain in the early 70s, followed by a drifting down to less than half of 1970 prices, and then a jump in the past two years. The recent spike represents a tripling in prices, but we can see that current prices aren’t way out of line with what was seen between 1975 and 1998. Still, the sudden jump is troubling; will it continue on at the current rate, or turn out to be just one more unusual spike in the graph?